To Cite: Barati Roshvanlo R, Rezaee A, Hossini H, Shiri M. Ammonium Removal by Nitrification and Denitrification in an Integrated Fixed Film Activated Sludge Process, Health Scope. 2014 ; 3(4):e18347. doi: 10.17795/jhealthscope-18347. Background: When nitrogen-containing compounds are released into the environment, they could create serious problems such as eutrophication of rivers, deterioration of water quality and potential hazard to human or animal health. Biological nitrogen removal is generally preferred over physicochemical methods due to its lower cost, lower chemical/energy requirements, and being environmental friendly. Objectives: The current study aimed to evaluate the performance of a simultaneous nitrification and denitrification in a modified integrated fixed-film activated sludge (IFAS). Materials and Methods: The ammonia and chemical oxygen demand (COD) (Ammonia 25, 40, 80, 120 and 160 mg/L and COD = 500 mg/L) removal were studied by the proposed system. Two reactors in bench scale with the capacity of 13 liters were considered. Effective parameters such as hydraulic retention time, COD consumption, and the effect of loading ammonia were evaluated. Results: Employing the BET, surface area (Sa), total pore volume (Vp), and average size of the nanostructure were 0.4026 m2/g, 3.808903 cm3/g and 44.7 nm, respectively. Results indicated that the desirable hydraulic retention time for nitrification occurred at 12. Due to higher COD consumption, there was no significant difference between the conventional IFAS and modified IFAS units. Based on the nitrification and denitrification results, the best condition for nitrifying/denitrifying performance was obtained by modified IFAS. Conclusions: Based on nitrification and denitrification data, the best condition for nitrifying/ denitrifying performance was obtained by modified-IFAS. Hence, the modification can be used to obtain the best activities of microbial and nitrogen removal improvement. Nitrogen compounds are examples of the contaminants which can create serious problems, when released into the environment, such as eutrophication of rivers, deterioration of water quality and potential hazard to human or animal health (1). Biological nitrogen removal is generally preferred over physicochemical methods such as membrane filtration, reverse osmosis, ion exchange, adsorption, and chemical treatment due to its lower cost and chemical/energy requirements (2, 3). Many consider the performance of a simultaneous nitrification/denitrification advantages that can be mentioned as (1) nitrification produces nitrite or nitrate, which is a reactant in denitrification, (2) nitrification reduces the pH raised in denitrification, and (3) denitrification generates the alkalinity required in nitrification (7). The advantage of simultaneous nitrification and denitrification for biofilm systems such as integrated fixed-film activated sludge (IFAS) can be described as (1) accumulation of bacteria enhanced by chemical modification of the membrane surface, and (2) the amount of supplied oxygen controlled by intramembrane pressure. The study succeeded in promoting the adhesivity and biofilm formation of nitrifying bacteria onto membranes modified with a grafted polymer chain (7). In order to evaluate the performance of simultaneous nitrification and denitrification, the authors applied the IFAs. In IFAS, the advantage of fixed film is added to the activated sludge. Flexibility and effectiveness of the process, stability of biological growth and resistivity against organic and hydraulic loads include the advantages of the system. 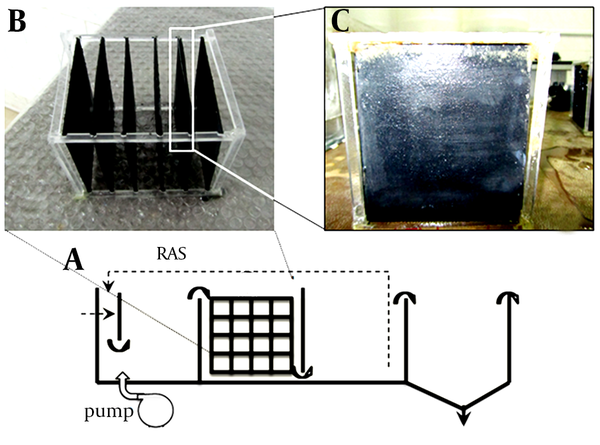 The current study investigated the potential of nitrification/denitrification and COD removal of the modified IFAS by a nanocoated medium. This modification and application of nanocoated structure were conducted by improvement of the film, mass adhesion, and attached growth characteristics. All regents and chemicals were prepared in analytical grade and purchased from Merck and Sigma Company. The synthetic feed wastewater was considered with about 500 mg/L COD content and 25, 40, 80, 120 and 160 mg/L of different ammonia concentrations. Finally, pH was adjusted in range of 6.8-7.2. The synthetic feed solution compounds are provided in Table 1. The applied nanomaterial (MWCNTs), purity more than 95%, was prepared from the US research nanomaterial Inc. The characteristics of the applied MWCNTs can be observed in Table 2. In order to provide the nanocoated bed, the polycarbonate bed was used. The antifogging coating method was utilized for the preparation. Briefly, the polycarbonate bed was rinsed by toluene to remove the impurity and oily contaminants. Generally, toluene causes a higher roughness on polycarbonate surfaces and improvement of adhesive reaction between nanoparticles and bed. Then, rinsed polymeric bed was heated up to 50°C and impregnated with tetra-methoxy-silane and binder material (patent formulation). Coating system compartment was consisted of vacuum pump, ultrasonic bath, reaction chamber, and antifogging coating system. The discharge electron process caused Nano coating. Final Nano coated medium was provided with three to five microns in thickness. The present study applied the IFAS process and its modification to evaluate the ammonia removal. Two reactors in bench scale (plexiglass with the capacity of 13 liters in 100 × 10 × 15 cm dimensions) were considered and the medium of modified-IFAS was coated with MWCNTs. Flow diagram of the integrated fixed film and the activated sludge are illustrated in Figure 1. Both suspended and attached growth could be used in the IFAS process. The medium filled 30% (in volumetric) of each reactor. In order to preserve the nitrification/denitrification condition the diffuser aeration system was applied. The mixed liquor suspended solids (MLSS) were inoculated at 2.5 g/L in the startup phase for 42 days with the hydraulic retention time (HRT) of 24 hours. In the beginning of main runs, the IFAS system was operated in HRT 4, 8, 12 and 16 hours and room temperature of 25 ± 1°C. All experiments (such as Ammonia, Nitrate, COD and pH) were performed according to the standard methods for the Examination of Water and Wastewater (8). The characterization of the surface was evaluated by transmission electron microscope (TEM) (Philips XL 30). The surface area and pore size structures were estimated by BET (Belsoro mini-II analysers). The results of the high magnitude from carbon nanotube coated on the medium with 2 to 5 nm are presented in Figure 2. This result exhibits high surface area and porous structures in the Nano coated media. 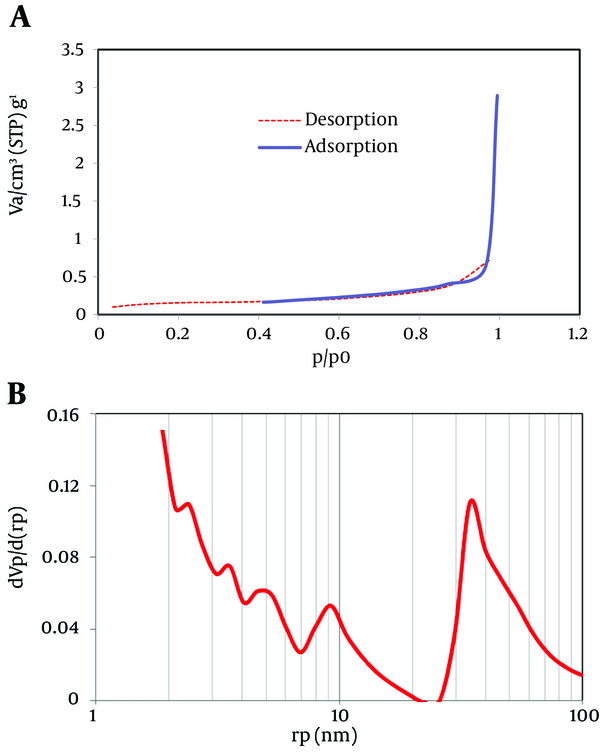 Figure 3 A and B illustrate the adsorption/desorption isotherm plot of the Nano coated media. Figure 2. 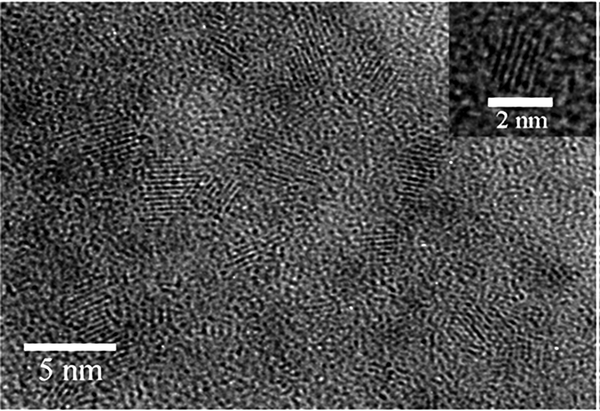 TEM Image From Nano Coated Medium (2 to 5 nm). A) N2 adsorption–desorption isotherms; B) pore size distribution of the corresponding nano coated bed. Results of the performance units with respect to HRT are presented in Figure 4 A. Ammonia depilation (nitrification rate) significantly increased with an increase in the HRT. According to results the desirable conditions for nitrification were provided at 12 and 16 hours of HRT. 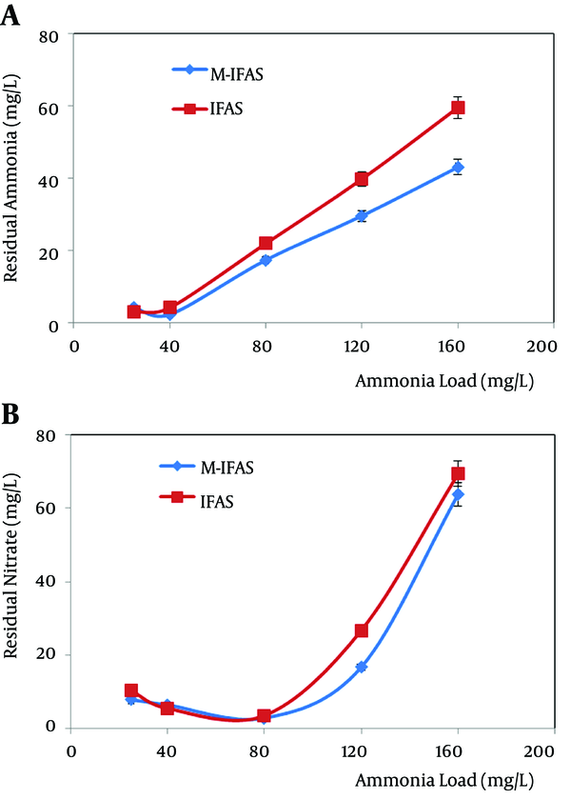 In addition, in these HRTs, the modified IFAS (with Nano coated media) indicated better ammonia depletion rather than the typical IFAS. The nitrate concentration of the effluent in the modified IFAS and IFAS reactors and different HRTs is presented in Figure 4 B. The results showed that the best condition for nitrate reduction was provided at higher HRTs. Due to outlet nitrate concentrations at all HRTs, there is a slight difference between the two systems. The COD concentrations of the effluent during different HRTs relative to the initial COD (500 mg/L) in both IFAS and modified IFAS reactors were investigated. The biological COD consumption was very low below 4 hours of HRT. The COD concentration of the effluent in IFAS reactor versus modified IFAS is illustrated in Figure 6 B. The effect of loading ammonia at 16 hours, at desirable HRT was investigated. Ammonia removal rate significantly declined with an increase in the loading of ammonia. Ammonia concentration of the effluent versus ammonia loading is illustrated in Figure 5 A. Regarding the overall performance, the removal efficiency of ammonia compared to the inlet feed was acquired by 87.6, 89.45, 72.54, 66.83 and 62.75 %, and 83.12, 94.15, 78.24, 75.31 and 73.06% at 25, 40, 80, 120 and 160 mg/L of ammonia in both IFAS and modified IFAS systems, respectively. Figure 5 B shows the nitrate concentration of the effluent versus different ammonia loading at 16 hours of HRT. The same trend of reduced nitrate was observed in the modified IFAS and IFAS effluents. The best results of denitrification were obtained in 80 mg/L of initial ammonia loading. At upper loading of ammonia, the efficiency of denitrification dropped. The next stage considered higher HRTs in range of 24 to 40 hours for upper ammonia loading. 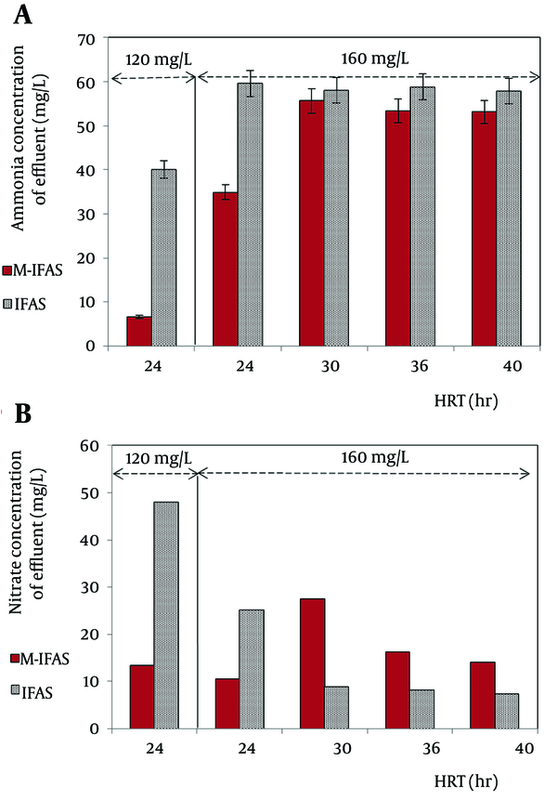 Respective results for ammonia/nitrate concentrations of the effluent at longer HRT in the two load regimes 120 and 160 mg/L are shown in Figure 6 A and B. Figure 5. The Ammonia and Nitrate Concentration of the Effluent Versus Different Ammonia Loading. A) Ammonia and (B) Nitrate concentration of the effluent versus different Ammonia Loading regimes [condition: HRT 16 hours, COD 500 mg/L, NH4+ 25,40,80, 120 and 160 mg/L]. Figure 6. Results for Ammonia/Nitrate Concentrations of the Effluent at Longer HRT. A) Ammonia and (B) Nitrate concentration of the effluent versus longer HRT in the two load regimes of 120 and 160 mg/L of ammonia [condition: 24-40 hours, COD 500 mg/L]. To create favorable conditions for nitrification and denitrification, continuous operation and a relatively long HRT are required (11). However, HRT is the main operating variable for biological stabilization. On the other hand, HRT and SRT (solids retention time) (as controllable operation parameters) are two major factors that contribute to different treatment performance and biomass characteristics (12). Figure 4 A and B illustrate the nitrification and denitrification rates based on HRT. Results indicate that the desirable conditions for nitrification/denitrification are provided at 12 and 16 hours of HRT. In addition, at higher HRTs, modified IFAS indicated a better ammonia nitrate removal rather than typical IFAS. Due to the outlet Nitrate concentrations at all HRTs, there is a slight difference between the two systems. Sriwiriyarat et al. operated the IFAS and activated sludge processes in parallel for carbon removal and nitrification at 6, 8, and 10 hours HRTs at 4, 6, and 8 days of SRTs. The AS system failed to attain steady state conditions at 10 hours HRT with 4 days SRT, 8 hours HRT with 4 and 6 days SRTs, and 6 hours HRT with 4, 6, and 8 days SRTs, whereas the IFAS system was stabilized until the SRT and HRT were at 4 days and 6 hours, respectively (13). With doubling the HRT from 4 to 8 hours, a significant decrease occurred in COD concentrations of the effluent. Similarly, consumption of COD was performed in both IFAS and modified IFAS reactors. Observed COD removal in terms of percentage for 4, 8, 12 and 16 hours were acquired about 66.8, 90, 92.8 and 94.86%, and 56.4, 89.34, 94 and 94.07% for IFAS and modified IFAS units, respectively (data not shown). Azimi et al. believed that the reduction in COD depended on the mean residence time and the ratio of bio-carrier to reactor volume (media: reactor volume), air velocity and media specification (14). As observed in Figure 5 A, in both units and lower loading rates, the ammonia was reduced successfully, but with an increase from 40 to 80 mg/L and upper loading rate higher amount of ammonia was observed in the effluent. This fact can occur due to ammonia loading shock for the biological mass. Comparing the two systems indicated that the differences in outlet ammonia concentrations were fairly significant, and application of the modified IFAS system in higher ammonia loading was more successful. Nitrate concentration of the effluent versus different ammonia loading at 16 hours of HRT is shown in Figure 5 B. Loss of denitrification efficiency at upper ammonia loading, may occur by loading shock and return toxicity shocking of ammonia to denitrify bacteria. Generally, the best condition to denitrify performance was obtained by modified IFAS. 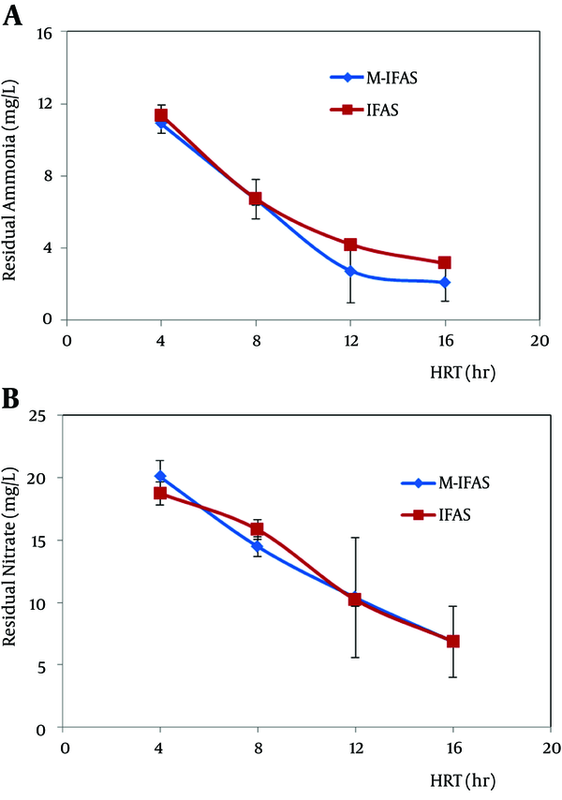 According to the results of the longer HRTs (24 to 40 hours), observed in Figure 6 A and B, the best ammonia removal condition was provided by the modified IFAS rather than typical IFAS system. In general, treatment outcome was not satisfactory at higher loading regimes. However, a considerable removal of ammonia was provided by the modified IFAS unit at regime 120 mg/L, but no significant amount of ammonia depletion was observed in regime 160 mg/L, even at longer HRTs. The same pattern was observed for nitrate. Nevertheless, denitrification efficiency was more suitable for IFAS system at longer HRTs and higher loading regimes. In the current study, a Nano coated media was prepared with MWCNTs and the N2 adsorption–desorption isotherm was investigated. Using the BET, the surface area (Sa), the total pore volume (Vp), and the average size of the nanostructure were 0.40 m2/g, 3.81 cm3/g and 44.7 nm, respectively. Due to higher R2 = 0.996, there was no significant difference between the two COD consumption of modified IFAS and IFAS reactors. Generally, based on the nitrification and denitrification results, the best condition of the nitrifying/ denitrifying performance was obtained by modified IFAS. Nevertheless, in longer HRTs (30-40 hours) and higher loading regimes (160 mg/L) denitrification efficiency was more suitable for IFAS system. The authors wish to acknowledge their gratitude for the financial support of Tarbiat Modares University and Northern Khorasan Water & Wastewater Company (Agreement No. 91.15.12377). Funding/Support: This study is supported by Tarbiat Modares University, Tehran, Iran and a financial support from Northern Khorasan Water and Wastewater Company (Agreement No. 91.15.12377).